Three years ago, when the Las Vegas economy was booming, a casino executive boasted that the conference rooms at Morgan Stanley and Deutsche Bank were adorned with aerial shots of the Strip. The displays highlighted properties with development potential, letting investment bankers set their sights on parcels of the seemingly recession-proof gambling biz.But that was then. Today, the house is on a losing streak. Casino gambling isn't currently a growth industry, and local real estate has tanked by more than 50% from its peak. Nevertheless, two investment banks are still betting big on casino properties -- but, like many of the best customers in Vegas, neither expected to get in so deep. Now, with the buzz worn off, Deutsche Bank is still at the table, holding a casino under construction that, if left unfinished, could have been the most conspicuous white elephant in town. When it opens, as it's scheduled to late this year or early in 2011, the $3.9 billion Cosmopolitan Resort Casino will be the first Vegas casino owned by a bank. Just a few years ago, a loan to develop the Cosmopolitan was looking like a sure bet for the German investment bank. Developed by Ian Bruce Eichner, the Cosmo was designed as a high-flying luxury condo-hotel-casino-resort. Its condos sold out on one amazing afternoon in October 2004, attracting the real estate equivalent of big-betting rubes, drawn in by spacious units with Japanese soaking tubs and views of the Strip. The buyers queued up at 4:30 in the morning, deposit checks in hand and a double-down mentality: Whatever they paid today, it would be worth more tomorrow. That was how real estate worked in Sin City. "The reps at Cosmopolitan weren't sales agents. They were order takers. People threw checks at them," says one rueful Vegas broker who stood in line that morning with 13 checks -- a dozen for his clients, plus one for himself. "We won't ever see it like that again in Vegas." He's not kidding. In August 2008, Eichner and his group defaulted on a $760 million Deutsche Bank loan, and the bank bought the Cosmopolitan out of foreclosure for $1 billion. Late last year, an affiliate of Deutsche applied for a casino license "as the 100% owner of the Cosmopolitan," according to the Las Vegas Review Journal. Since then, some of the project's thwarted condo purchasers have received refunds on 74.4% of their deposits. Others still need to sort out contractual issues before getting their refunds. An attorney representing stung buyers has described the payback as "a windfall profit for Cosmopolitan" -- but it could have been worse. Vegas real-estate values have plummeted so steeply that purchasers almost certainly won't get bank financing in order to close on the units at their original prices. Jim Dunn took the money and ran. The owner of luxury-property management company Blue Chip Vegas, Dunn had put down deposits on multiple Cosmopolitan units. "The 74.4% is before the attorney's cut, so I ended up netting 64%," he says. "They've since offered the hold-outs 74.4% without the attorney's cut, so I would have done better if I had waited another couple weeks. But considering all that's happened recently, a 35% hit isn't so bad." Dunn believes Deutsche wants to turn Cosmopolitan into a pure casino-hotel resort, without the condos, which will make it easier to sell eventually. John Unwin, the well-regarded former general manager of Caesar's Palace, will serve as the Cosmopolitan's CEO, in a battered market challenged by a glut of discounted hotel rooms and unsold condominiums. Bad Luck in Vegas and A.C.
Deutsche isn't the only bank to roll snake eyes on a loan -- and Vegas isn't the only seductress in the gaming industry. Credit Suisse last year took over Resorts International in Atlantic City -- the first hotel to have opened on the Boardwalk, back in 1978 -- after the casino's mortgage holder, Colony Capital, missed a $360 million loan payment. Revenues in Atlantic City, America's second-largest gambling mecca, tumbled 13.2% in 2009. 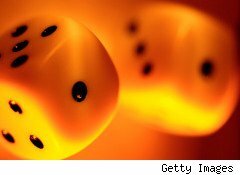 And with Pennsylvania's recent decision to legalize table-games like blackjack and craps, A.C.'s comeback prospects for 2010 remains a long shot that only a dice fanatic could love. And that makes two European financial institutions that have taken over American gambling operations within the last year. But considering the banking industry's recent appetites for greed and risk -- particularly when the public has the worst of it -- Deutsche Bank and Credit Suisse seem to have landed, inadvertently, in just the right line of business.